Have you ever watched a frog hunt an insect? Sometimes the bug positions itself smack in front of the frog’s face for consumption – but even bugs have Darwinian instincts, so that’s fairly rare. 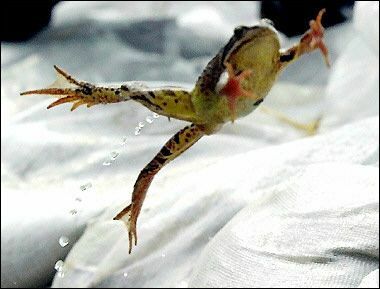 Instead, the best way for the frog to go after what it wants is to abandon the comfort of its lily pad, leap into the air, and completely surrender itself to the quest. It understands it may splash back into the pond without its intended prize. It understands it might plop smack into the jaws of a crocodile. The leap is a risk. The leap is also possibility. The leap is where the catch happens. Granted, the frog’s life depends on bugs for sustenance. And while we, as humans, no longer need to hunt prey to survive, as evolved beings, we need to hunt experience. Personal growth. Authenticity. That’s what allows us to survive and flourish in the 21st century. We’re no longer on this earth simply to propagate the species. We’re here to uphold it and help it evolve – through our unique, individual gifts. Each of us has at least one and our job is to serve it up to the world. That’s why we’re here. Maybe your gift is creating objects or systems that make the world run more smoothly. Raising children who will give back through their own gifts. Cultivating or preparing food that nourishes, sustains, and pleases. Healing people or animals. Educating, entertaining, connecting, making others laugh, cry, think, act. But you do have a gift. Your job is to figure out what it is and use it. Otherwise you’re missing the point of modern existence. I first thought about the frogs years ago when I’d just taken my own leap of faith by quitting my cushy, stable consulting job and vowing to succeed as a freelance writer/new business owner in New York. I was living off my savings. Temping at BofA at a 95% pay cut. Ushering off-Broadway plays in exchange for free admission. Coughing up $5 every now and then to check out up-and-coming comedians and musicians in the East Village, Lower East Side, and Brooklyn. Losing tons of weight because all I could afford was produce and I walked most everywhere to save on MetroCard fare. But the leap paid off. I’m my own boss, in charge of my workload and workday. My main goal was to simply work independently and escape the weight of the corporate thumb; instead, by being true to myself and my gift with words, I’ve experienced a level of success beyond anything I ever imagined (not that I ever aimed that high…this is no Zuckerberg venture I’m running here). My low-carb, high-cardio lifestyle actually stuck and I’m healthier as a result. I’ve also had the absolute pleasure of watching some of today’s most talented artists – often just a few feet from the stage – pay their dues and rise through the ranks. Being true to themselves and reveling in the journey. When I tell people my story, they often say, “It was worth the sacrifice.” But “sacrifice” implies loss, reduction, negativity. I would never define those years, those “salad days,” in such terms because I gained so much during that time. It was simply leaping off one track and onto another. Releasing my grip on the old, the comfortable, the unsatisfying to usher in the new, the adventurous, the soul-feeding. The authentic. And that time I was in the air, in between – that was the best part. Do you ever think about leaping? I’ve been thinking it’s time for me to do it again. To usher in the newer, the uncharted, the soul-sustaining. The even-more-authentic. And so my thoughts return to the frogs as I remind myself – and you – that the good stuff rarely just drops by the lily pad. It doesn’t even arrive with the landing. The good stuff – the really, really good stuff, where dreams are realized and gifts are given – is in the leap. This entry was posted in Faves, Inspiration, Nicole's Soapbox. Bookmark the permalink. So where the F is your new website, woman? !